I’ve written about Japanese New Year’s traditions and I’ve even posted some typical Japanese New Year’s dishes. But this year I decided to go whole hog and make an Osechi Jubako from scratch. 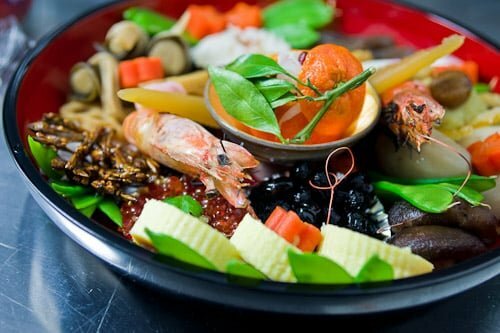 Osechi Ryori_ (お節料理) is a subset of Japanese cuisine made up of dishes that are traditionally eaten on Oshogatsu (New Year’s). 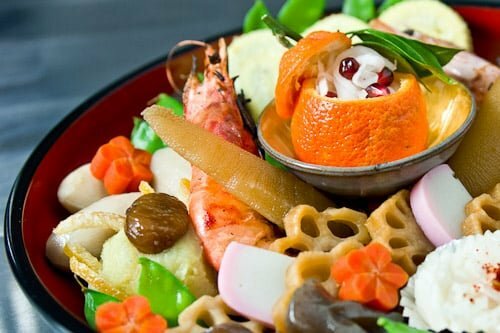 Since it was historically taboo to cook on New Year’s day, Osechi dishes are typically stewed with lots of sugar, or they are vinegared to preserve them. There’s a huge variety of dishes, each one, a symbolic wish for things like long life, wealth, fertility, and happiness. 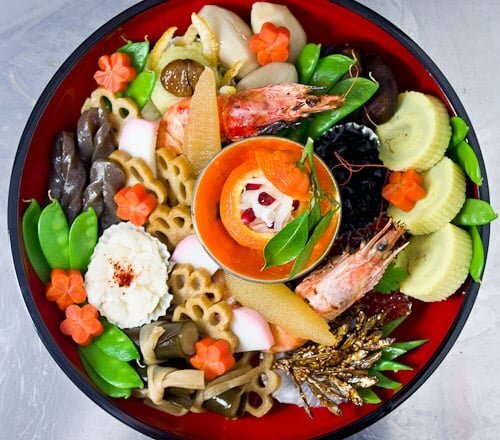 The food is then meticulously plated in a 2-3 tiered lacquered box called a jubako, which the whole family eats from. Since I was trying to save some money, I went with a cheap plastic dish that’s intended to be used for serving cold soba. Gobo Kobumaki (昆布巻) – Burdock root wrapped in kombu, tied with kanpyo (a kind of gourd) and simmered in niboshi dashi. Burdock is a very long root that symbolizes the Japanese ideal of a life, long and stable. This preparation also represents joy, as “kobu” sounds like “yorokobu” which means joyful. Renkon no Nitsuke (レンコンの煮付け) – Lotus root cut like chrysanthemums then fried and simmered in a sweet soy sauce. The many holes in it allow us to look through to the year ahead. Kikuka Kabu (菊花蕪**) – This is a whole baby turnip cut to look like a chrysanthemum flower that’s then pickled in vinegar, salt and sugar with some chili pepper in the middle. The chrysanthemum is the symbol of the emperor and is used to mark joyous occasions. Pirikara Konnyaku (ピリ辛コンニャク)- Konnyaku (yam jelly) simmered in a sweet and spicy sauce. 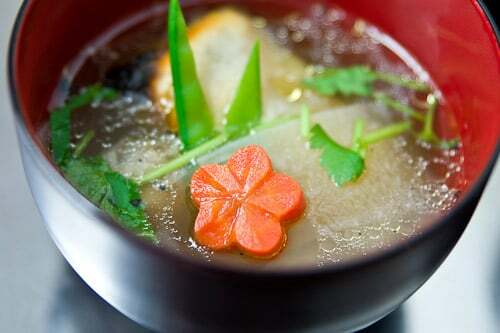 Nimono (煮物)*- Fresh baby taro, carrots carved like plum blossoms, and shiitake mushrooms simmered in a katsuo/kombu dashi. The shape of the carrots in this dish is symbolic in that every plum flower bears one fruit, making this another wish for fertility. Kuri Kinton (栗金飩) – Sweetened and mashed Japanese sweet potatoes with sweet chestnuts. The characters for kinton literally mean “group of gold”, so with the golden color of this sweet, it represents a wish for wealth and financial success in the new year. Ebi no Shioyaki (エビの塩焼き) – I brined these giant shrimp in a 50/50 salt sugar mixture for 5 minutes before grilling on a stove top fish grill. The shape of the shrimp is similar to that of an older person and represents longevity. Kazunoko (数の子) – Herring roe seasoned in katsuo/kombu dashi and soy sauce. These crunchy roe sacs each contain thousands of eggs and symbolize a wish for fertility. Kamaboko (蒲鉾) – The quintessential pink and white Japanese fishcakes are traditionally sliced and layered in alternating rows of pink and white. While it’s a stretch to say that pink and red are the same color, the bands of “red” and white kamaboko are supposed to symbolize the rising sun. I had big plans for doing some elaborate carving here, but after hand carving a dozen carrots in the shape of plum blossoms, I decided to go with a simple slice. Datemaki (伊達巻) – These sweet golden rounds of egg and hanpen (fishcake), have a ribbed outer surface mimicking the shining sun, a wish for sunny days ahead. Tazukuri (田作り) – Baby dried anchovies are roasted and coated with sweet caramelized soy sauce and sesame seeds. Tazukuri, which literally translates to “making rice fields” symbolizes a bountiful harvest. Kohaku Namasu (紅白なます)- Red and white vinegared daikon. This dish is traditionally made with carrots and daikon, but I decided to mix it up a bit and used pomegranate seeds instead of carrots, and replaced the sugar that usually goes into it with mandarin juice. The combination of red and white is a recurring theme in many osechi dishes and symbolizes happiness and celebration. Finally, no oshogatsu meal would be complete without o-zoni (お雑煮), a ubiquitous soup with rice cake that has about as many variations as there are cities in Japan. Everything from the stock, to the seasoning to the stuff that’s inside varies, but one common thread is that it always has a piece of mochi (sticky rice cake) inside. For my version, I took some dashi taken from katsuo, kombu, and shiitake and simmered some nankotsu (chicken cartilage) in it for several hours, I seasoned it with soy sauce and mirin, then added ribbons of daikon, and of course, a toasted square of mochi. What are some of your culture’s New Year’s traditions? I’ll be posting recipes for some of these throughout 2010 and linking to them here, so if you want to make your own osechi to celebrate 2011, bookmark this page and come back in December for all the recipes. whaaaaaa?!?!?! this looks amazing and delicate. i bet it tastes amazing too. the colors are so vibrant. i would love to have a bowl of this any day! Absolutely amazing. Fortune smiles upon those who go through the efforts to make such a beautiful meal. I’ve never made this, just been lucky to enjoy the fruits of others’ labors on New Year’s. The most effort I’ll go through is mochi and this year I just stuck with my mom’s simple mochi custard bars! Beautiful, beautiful post. Thank you for sharing this amazing meal! In the words of the ladies of the hahanokai at my community center, SUBARASHII!!! That is so visually stunning!!! I hope you share on how you cut & etched the carrots!! Gorgeous! Was all that time worth it? GORGEOUS! 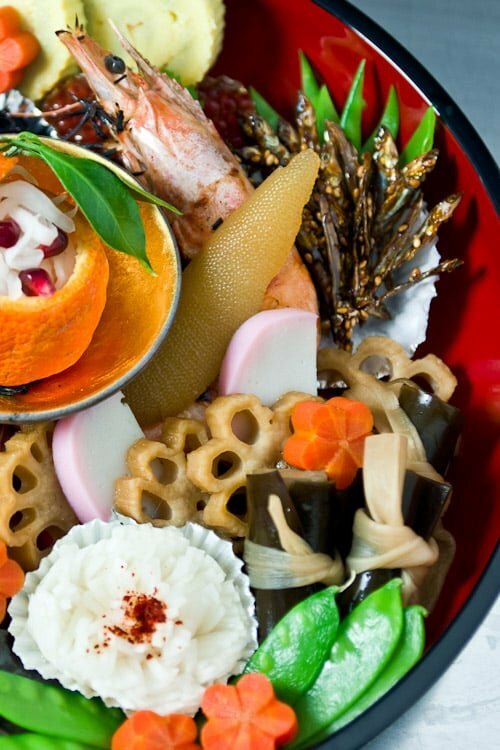 So sad to have missed out on all the osechi ryori fun this year. I have especially large soft spot for ozoni and kuri-kinton. That is absolutely GORGEOUS. I understand the “misguided effort” part at the beginning. I made the same mistake with an antipasto platter one year. It ended up costing more than the entrees for a group of 9. Such beautiful presentation! looks so delicate and delicious! Happy 2010! Amazing. I had no idea about this tradition, and love the symbolism behind each component. It looks beautiful AND rather tasty too. Looks wonderful. Happy New Year. Can’t wait to see the recipes. So beautifully done. Thank you for sharing this with us. Love the Nimono, so intricate and beautifully carved. This looks so beautiful! I am now wishing that I would have planned far enough in advance to do something like this. What a great accomplishment! I love the addition of the pomegranate seeds for a unique twist. The color really pops and brings something beautiful and fresh to the presentation. Fabulous job!! I am prostrating myself in your awesome presence, refusing to look up for fear of being blinded by the glory of your talent. This is the kind of stuff that my ancestors hoped I would be able to do. Well, they hoped wrong. If you haven’t already, you should do a post on how to carve vegetables the Japanese way, Marc. Really. Shoot. Forgot to answer the question. The Thai new year is celebrated in April based on the Theravada astrological calendar. We smear each other with fragrant chalky stuff and throw water at each other. Why? Long story. We’re not weird, we’re just trying to relieve the pain of extreme heat and humidity in style. This looks amazing. In my family the New Year’s tradition is to go to no effort at all, because of all the cooking that takes place in December. Wow! What an in depth look at Japanese New year foods…I’m amazed at all the symbolism…wonderful Marc! Mmm hard to say. I guess it was one of the better osechi meals I’ve ever had, but part of the fun of eating osechi is all the little surprises you find in the jubako, and since I put it all together, there were no surprises for me. Great post! I liked the explanations about the symbolism. Next time, get a jubako for it. Gives you more room to “use up” all the extra food. Wow! It looks incredible with all that colour and texture! I love how symbolic each and every ingredient is. Amazing and exquisite accomplishment! Thanks for sharing. That looks incredibly gorgeous! Happy new year, Marc 🙂 I especially love how the lotus root is carved. AAH! You beat me to it! I was going to post about my family’s osechi ryori, but I haven’t had time! Oh well! Post will still be up soon since my obasan makes the best o-zoni. But I’m going to have to say, your presentation takes the cake! That seems like a very very involved process but the end results are amazing! Great pictures and write up – I’ll have to share this with my Japanese friend and ask her to make it for me one day! Marc this looks amazing – I am lost for words! What a fantastic job you’ve done!! I would LOVE to try this but I have not a chance at making mine looks anywhere near as good. Wow, very involved preparations for New Years Day. Thanks for explaining the underlying symbolism. In Germany (at least in the part I come from) there’s a tradition of making large pretzels from a sweet, yeasted dough (like one would use for Challah).